The PC is dead. Long live the PC. With Sony, Microsoft and Nintendo faffing about rather than releasing next generation consoles, the PC has had an excellent resurgence of late. PC gamers have access to techs, specs and features that would blow an Xbox or Playstation up. However, without trying to sound like a trite pop-psychology self-help book, the potential of your PC is rarely realised because you've been used to half-arsed console ports. Pass the tissues. A perfect example is Dice and NVIDIA's work on Battlefield 3 in 3D. Probably running in the opposite direction of EA execs, Dice opted to go back to the PC as the development platform of choice for its triple AAA tentpole Battlefield franchise. 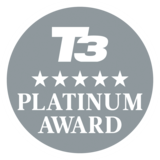 We've played Battlefield 3 on all consoles and PC formats and can say, unequivocally, that you haven't played Battlefield 3 unless you've played Battlefield 3 on a PC. Now we've already reviewed Battlefield but we were waiting until NVIDIA and Dice had a fully working stereoscopic patch to give you our thoughts on playing it in the third dimension using NVIDIA's sublime new 3D Lightboost tech and bigger NVIDIA 3D Vision 2 glasses. You don't have to spend a fortune on a new PC to run Battlefield 3 in 3D… but it helps. NVIDIA's new 3D Vision 2 kit is actually relatively cheap at £149 for pair of active shutter glasses and an IR receiver. The glasses are bigger, more comfortable and block out more back ground ambient light. But the deal clincher is hooking the glasses up with a flat panel that supports the new super-bright Lightboost tech. We used the 27-inch Asus VG278H, which costs £565, has a HD LED display, a 120Hz refresh rate to cope with NVIDIA's 3D tech and a speedy 2ms response time. It also has a 3D HDMI 1.4 input and a Dual-link DVI input. We were lucky enough to have an NVIDIA white box system with 6GB, Intel's flagship core i7 processor and with two GeForce GTX 580 cards hooked up in SLI mode. The legacy of being built in a PC means Battlefield 3 has more settings than you could shake a stick at. That means, you can still play in 3D on a lower specced system by turning down one of the many graphical bells and whistles in the options menu. As we said, we were lucky to go to war on a brilliant system and gamed in 3D with everything set on ultra. 3D can absolutely kill a system. Jargon aside, in effect you are running the game twice simultaneously when you press the CRTL then T button so it will take out lesser PCs. But we managed to maintain over 48FPS for smooth HD playback and that's on servers with 64 players running about at the same time. The only time we suffered any staccato playback was a server issue rather than a problem with the hardware. Obviously the 3D is given an incredible boost by playing with the effects setting on ultra because the added debris, smoke and explosions are rendered with much more dimensional panache. With the best audio we've heard in any title this year, the effect can be disorientating – in a good way. We also played with the 3D slider at fill tilt and had no headaches to report after long sessions. We did experience minimal ghosting but that was easily rectified by turning the 3D down and we can vouch that the Lightboost tech is a big winning point for NVIDIA. 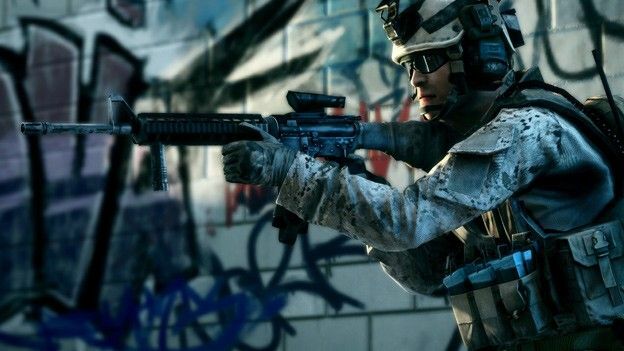 As a game, Battlefield 3 didn't get five out of five stars in our review. There were too many issues with the weaker single player campaign and too many problems as a console venture. However, as a 3D PC experience it is an unqualified succeess and a five star product.